The breathtaking thing about The Time Of Angels is how adroitly it switches tone several times throughout the episode without bending the entire narrative out of shape. The pre-titles, simulating much of the frisson of similar sequences that opened many a James Bond movie, especially those that contain huge, gimmicky stunts, are slick, dynamic and full of splendid excess. The very clever opening starts with a brilliant piece of editing, jumping from the imaginings of one of the crew of the Byzantium, lost in drugged reverie from the application of River's hallucinogenic lipstick, to his real location on the ship. We then see River make her escape, close ups on her shoes (so glad the 'shoe agenda' has made a return after Chrissie clobbered that Sontaran with a pink slingback in The Sarah Jane Adventures), close up on her sunglasses as she burns a message into the Home Box and then a bewildering leap to the Delerium Archive some 12,000 years later where the Doctor picks up the message and sets off to rescue her. Only Doctor Who could audaciously bound from one location to another in the space of minutes. River's confronted by the suave Alistair and his henchmen in a wonderful piece of metatextual playfulness with actor Simon Dutton in tuxedo and bow tie, looking for all the world like he's stepped off the set of The Saint TV movies he made in Australia in the late 1980s. River's evacuation from the Byzantium and the rendezvous with the Doctor contains more excitement, visual spectacle and wit in its four minutes and fifty five seconds running time than the entirety of last week's Victory Of The Daleks. As River says, 'You might want to find something to hang on to' as she primps her hair and reads out the co-ordinates for her impending rescue. You could bottle this and sell it back to Barbara Broccoli. Immediately she collapses on top of the Doctor, the tone shifts again. Alex Kingston and Matt Smith dash around the TARDIS set, she channelling the sophisticated wit of Kate Hepburn and he the sulky, petulant jitteriness of Jimmy Stewart in what feels like a restaging of The Philadelphia Story. Moffat's comic timing and repartee provides both actors with a gift and they respond with performances that balance eccentric humour, wisecracks and sentimentality. As they nag at each other there's that lovely moment where River uses the blue stabilisers and lands the ship. It's one of Moffat's reflections where he shares with fans those little things that are clearly iconic of the series and offers them back to us through the prism of the narrative itself. When Matt does his impression of the TARDIS materialisation sound effect, now denied the machine by River taking the brakes off the ship, I wonder how many of us recall trying out our own impression of that 'wheezing and groaning' as children and adults. Knowing the Doctor he'll put the brakes back on for take off because, as we all agree with him, 'they're blue boring-ers' and it wouldn't be the same without that familiar sound. And it's the details that matter too. The playful comedy as River hangs her shoes up on the scanner screen as she spouts a load of gobbledegook and taps away at a keyboard whilst Amy, eyes popping out of her head at this amazing woman piloting the TARDIS, is just sheer joy. As much pleasure to be had as in hearing the old 1980s console sound effects too. Matt is superb as the indignant Doctor, huffy and childish, as he sarcastically counters River's need for environment checks by standing at the TARDIS door and rather smugly reels off his own assessment. We then move to 'epic' mode with the production team pulling out the stops for the crash of the Byzantium with some impressive visual effects and gorgeous location work where director Adam Smith, in homage to David Lean, dwarfs his human figures with the sweep of their surroundings. Whilst the pretty pictures keep you agog, the screwball comedy continues and Amy and River get to bond over the Doctor's discomfort and rib him mercilessly as River clambers over the wreckage in evening dress, clutching her shoes with a handbag over her arm. The woman certainly knows how to make an entrance, I'll give her that. 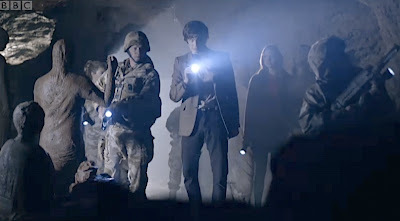 When River signals a group of soldiers from the 'Church', lead by Father Octavian (Bishop, second class, 20 clerics at his command) and enquires of the Doctor about the Weeping Angels, then the tone shifts again. Amy, wonderfully oblivious to all the machismo being played out around her, goes for the jugular in her conversation with the Doctor, asking that vexed question about River Song we've all been wanting a definite answer to. Moffat and the two Smiths conspire against us with that extremely deft bit of line reading which either answers the question directly or merely confirms that he is indeed Mr. Grumpy Face today. It's back to how you interpret it for yourself. Night falls and the episode becomes plainly what Moffat had been telling us would be his Aliens style sequel to the standalone Blink. Again, director Smith goes for those widescreen landscape shots to establish the change and the story takes on board the visual tropes and allusions to Cameron's film as well as harking back to the series own Earthshock, that game-changing story of 1983. Where Aliens was partly a metaphor about the Vietnam War, Moffat offers something quite intriguing here. This is clearly a religious war of some nature. As the Doctor pronounces to Amy, after she's now accused him of being Mr. Grumpy Face (a lovely bit from Karen) and he's catalogued his rather busy day to her, it's the 51st Century and the church has moved on. Once the story's framework is established, our expectations are focused initially in the chilling sequence where Amy is locked in the landing craft (by whom is not revealed and remains a mystery) and watches the video tape loop of the Weeping Angel in the Byzantium's hold. Moffat has obviously been watching his Asian horror films, particularly Ringu with its own deadly videotape, its folklore about the 'monstrous' and its fetishisation of fear. 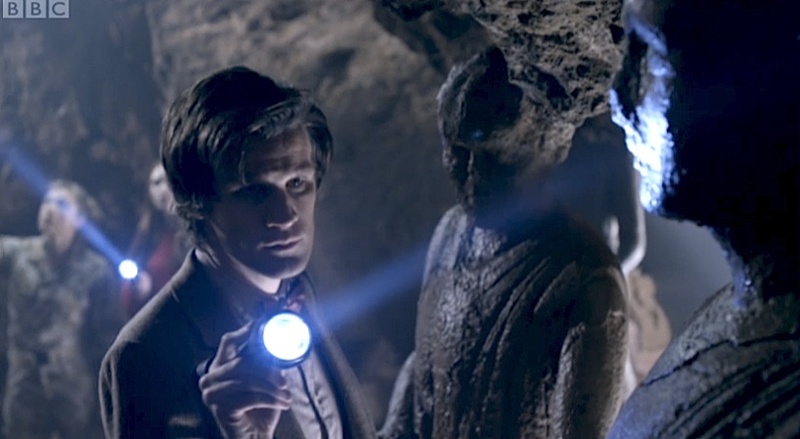 The urban legend of the Weeping Angels ('don't blink'), promulgated by that equally interesting use of the familiar medium of DVD 'easter eggs' where the Tenth Doctor provides Sally Sparrow with a bluffer's guide to these quantum locked beasties, is augmented here by further extending their power in the haunted landscape of communications technology and surveillance footage. Like the iconic image of of the monstrous Sadako in Ringu, the Weeping Angel materialises out of the video loop to kill Amy simply by virtue of her own fascinated gaze at the video image. Moffat is no longer confining these agents of fear within the video image but is allowing them to spill out into Amy's (and by extension our own) reality. Amy's gaze into the image of the Weeping Angel offers a complex weave of character, spectator and viewer all colluding to seal the fate that befalls her, where she, us and the monster all become one, the surveyor and the surveyed. 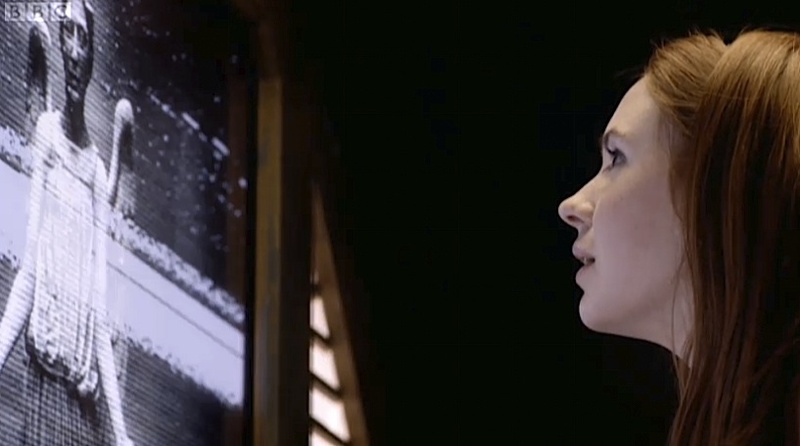 Amy's curiosity and interrogating gaze replicates our own fascination with viewing the fearful and the horrific and Doctor Who's own obsession with monsters, fear and death. Ultimately, this fascination becomes the instrument of possession that then plays out as the image of the Angel burned into her retina enters her consciousness and changes the nature of the threat from the physical materialisation of the Angel to something more troubling; her loss of control and loss of humanity. Moffat subverts that old phrase 'the eyes are the window to the soul' (various sources from Cicero to Matthew) by suggesting that images have the power to change us, possess us, enter us. Amy has been changed, even 'radicalised' by the image of the Angel. "That which holds the image of an Angel, becomes itself an Angel" doesn't merely allude to the creation of Angels but also to how the image affects the viewer, with the crackling, indistinct footage of it interestingly alluding to proselytising grainy video messages from the frontline of the jihad. She is aware she is being transformed by them, her mind altered by their cause, further emphasising the episode's subtextual interpretation of religious indoctrination via media and warfare. The conflation of religious order - the bishops and clerics in the squad - with the camouflage gear that wouldn't look out of place on the troops in The Hurt Locker - indicates a scenario caught up in the aesthetics of the 'war on terror' with an apparent 'crusade' to find the Weeping Angel in the hold of the Byzantium and destroy it. In a similar way that Aliens itself could be seen as a metaphor for the Vietnam War, then this 'holy war' on the Weeping Angels could be seen as a possible reflection on the continuing cultural and ideological clash between the West and Islam. The Weeping Angels as a creeping, amorphous, unpredictable army (the 'difference between dormant and patient') waiting for the call to re-emerge suggests the only partly perceived and often invisible threat from the 'war on terror'. As the episode unfolds in the catacombs this threat refuses to be fully described, pinned down, filling the characters with a sense of great uncertainty. If anything, The Time Of Angels articulates some of our own fearful distraction with national security and global security. 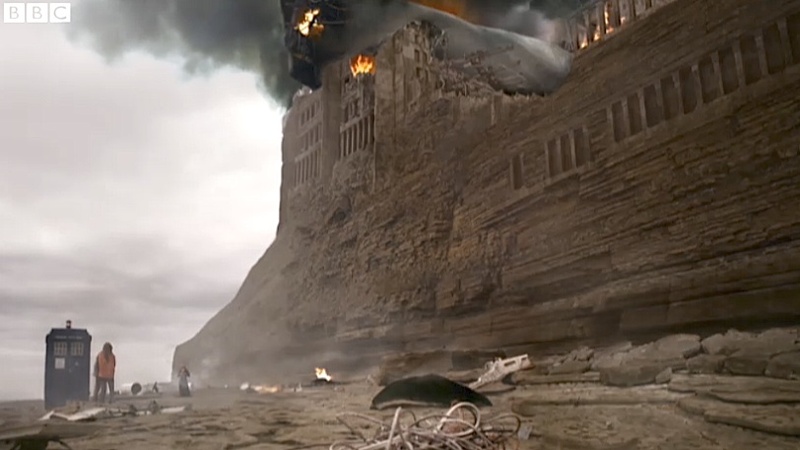 As the Church's army, the Doctor, Amy and River attempt to get to the Angel in order to destroy it, the episode mimics the structure of Cameron's Aliens in that the technologically superior force of the soldiers (and one presumes their Western religion) is slowly reduced to desperation by the 'other', the Angels and their alternate doctrine. 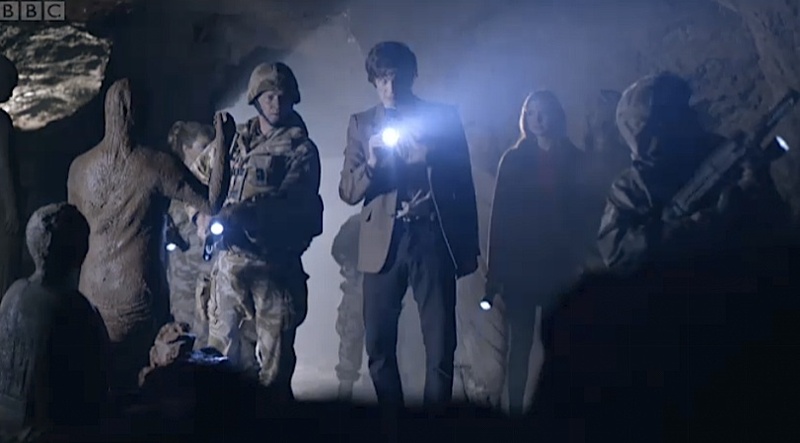 Moffat uses classic genre tropes, showing young soldiers gradually being compromised by the Angel, and adds a further twist to some of the ideas he developed with the data ghosts in The Silence In The Library by having the Angels possess the dead men's consciousness to use them as the voice of the enemy, broadcasting back to the survivors about the Angel's subversive conquest. 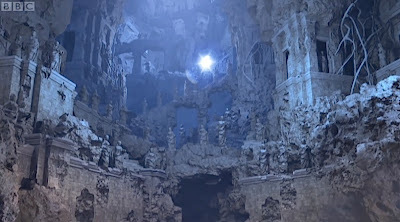 Fear, and not overt horror, is the episode's stock in trade and the sequences in the maze of the dead are beautifully shot, the darkness constantly pierced by torches with Adam Smith's cinematic framing and cutting rehearsing much of the similar hand held material present in Aliens, and articulating the episode's desire to paralyse with anxiety and dread. There is also the question of gender here where the Angels, when fully formed, appear to be female and the story plays on the patriarchal fear of the feminine power embodied in the creatures as they hunt down the gun toting squaddies. The nature of this fear, whether it be gender based or not, is also nicely flagged up in the conversation with Bob (with Moffat knowingly transposing Sacred with Scared - also suggesting some form of divine terror perpetuated in the clash between the Church's soldiers and the Angels) that underscores the series continuing fascination with fairy tales as a mechanism for coping with fear. What's also clear is that with two parts to the story there is plenty of time to create atmosphere, develop the story and invest emotionally in the supporting characters, particularly the return of River, which was something that last week's episode singularly failed to achieve. Considering this was shot in the first block of filming, Matt Smith shows us that he was no fluke, hit the ground running with an assured performance, fulfilling his promise from day one. Kingston is splendid as River Song and is well on the way to creating one of the series most iconic characters. Karen Gillan continues to surprise with a spiky interpretation of Amy and is showcased particularly well in the chilling scene with the Angel in the tape loop. Cinematography, production design, visual effects and music all adeptly decorate the story and in director Adam Smith the producers have found a talent who seems more than capable of bringing this mix of Guillermo Del Toro and James Cameron, screwball comedy and spy-fi, spectacularly to life. A classic in the making. So please don't drop the ball for the second part. A completely revised and much fuller version of this review is now available in my book Doctor Who: The Pandorica Opens - Exploring the Worlds of the Eleventh Doctor published by Classic TV Press and is also available on Amazon. Great review as always, Frank. Personally, I found the pre-titles bit felt awkward and overstaged. Compared to the screwball comedy delivery style when River's next to the Doctor, the way she went calmly and deliberately through her lines sounded a bit forced. The airlock felt extremely unrealistic, too. Not to be picky, but the TARDIS wasn't THERE until she was hurtling through no-atmosphere, so there was no "atmosphere corridor" for her. I noticed something else in that sequence that's been bugging me for a few episodes too now. It looks like the Mill's CGI TARDIS hasn't been updated to reflect the new physical prop with the different blue and darker windows. It's pretty jarring (and in the title sequence every week). Am I the only one who's noticed this? 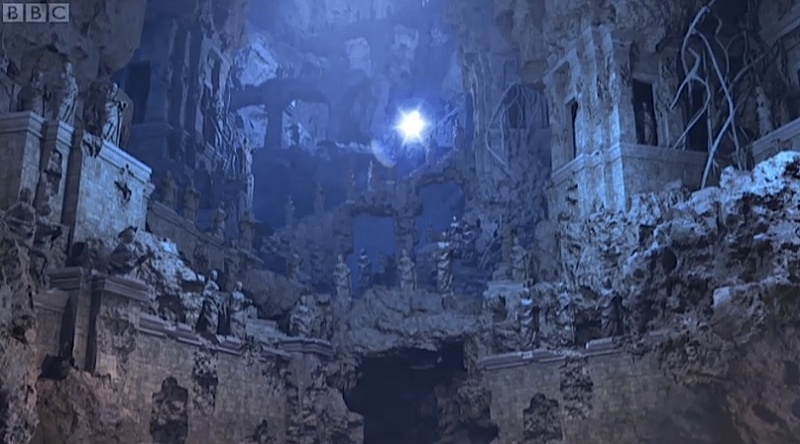 Other than that ... the angel-TV sequence was genuinely thrilling, and the slowly building sense of dread and the reveal of the angels in the maze was great. 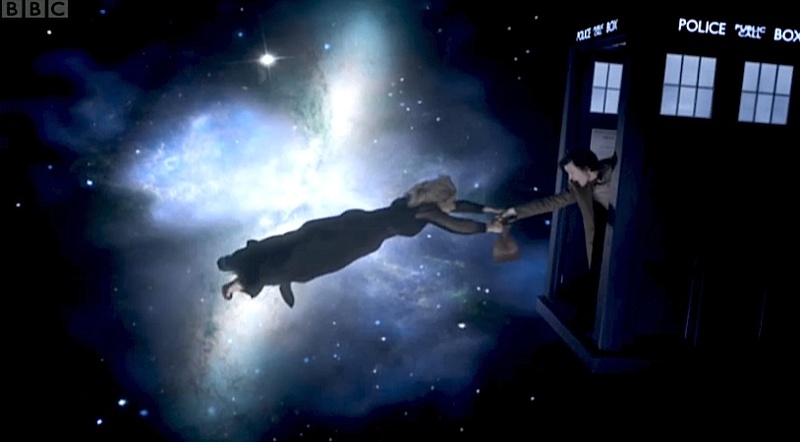 The way the Doctor kicked the gravity globe up, also a nice little nod to Smith's much-mentioned love of football. But ... I did feel that the cliffhanger lacked "oomph". The angels are coming, yes but the Doctor grabs a gun, delivers a speech over a communications device (lack of tension) and fires at the gravity globe. Credits. Huh? I was totally gripped from the start. Great atmosphere throughout, some tongue-in-cheek moments to enjoy, absolutely tasty dialogue from Karen, Matt and Alex. And speaking of atmosphere, although there seemed to be no "atmosphere corridor" to protect her (OK, yes, that scene could have been written with a little sharpness and clarification), I didn't feel that it really mattered. How many times have we forgiven a good film when the writer takes a liberty here and there simply to give the scene more impact? The only downside for me? Have to wait until next Saturday to watch the conclusion! I always twitch a little bit when a review of something like 'Doctor Who' mentions gender politics, especially when the embodiment of the female is only coincidentally female. I've felt that the Angels are more androgynous than anything, but perhaps that says more about what I think about angles than what the show says. So fair point. I liked the pre-credits sequence, because River Song had a bit of an Emma Peel riff going and while she was doing that she was interesting. When we hit 'old married couple' territory she instantly becomes much less so. But there are hints that River might not be who she's presented herself as being and I find myself wondering whether River Song might also be a stainless steel rat in a fur coat. A militant church is nothing new. Perhaps there's a crusade afoot? The buildup to the cliffhanger did lack something, and since you bring it up Frank, what's missing is in 'Aliens' - the tick tick tick of the motion tracker. What the Angels lack is a sound that tells us they're getting closer and that lack of a tension cue really does affect how the buildup works. Also, is it me or is the incidental music so quiet as to be missing? I'm really not hearing it this season. I think the worst thing that River Song did, and the worst thing that Moffat has done to date (in a very, very short list of things I disagree with), is to completely disregard a scene in a previous finale. To whit, the scene where the 10th Doctor, surrounded by his adopted family, finally has enough people to fly the Tardis smoothly. Of course, River -ing Song could have done it all by herself using the blue boringers, because she's Mrs Smug from Smugtown, Smugshire, Smugania. Perfectly willing to accept their androgyny. Makes the sexual politics even more interesting! I love River as Mrs Smug from Smugtown, Smugshire, Smugania. Merely because I think she's going to turn out to be up to her neck in trouble as suggested by the episode and the on-location spoilers. Moffat'll bring her down a peg or two. I like those really snappy edits in the build up to the advancing Angels. Gives it a bit of welly but I'll concede that Adam Smith could have ramped it up further. I have to say for all the production team bluster of 'the scariest series yet' it hasn't quite delivered. Maybe next week. I had noticed the incidentals on this were subdued. Interestingly enough Matt Hills book 'The Triumph Of A Time Lord' described how RTD always asked for 'Big Tunes' on the episodes. Maybe Moffat prefers something less Korngold type film score, which is what Murray delivered in the RTD era, and is heading back to the more atmospheric, unearthly stuff. I really liked the subtlety of the score on 'Time Of Angels'. Bombast would not have worked. As much as I liked this episode, in itself, it didn't arrest my sense of decline. The Time of Angels was great - but it was essentially a re-hash of Blink and Library, as much as Smith is a re-hash of Troughton/Davison. River Song is just wonderful - and here I really disagree with FRANK: she shows up Amy "I have no character" Pond. A friend commented that Ms Pond is just straight guy wish-fulfilment. Come back Rose, all is forgiven. Frank, your reviews are wonderful, when can we expect the next one for Flesh and Stone? Brian, I should be posting soon. This weekend has been a bit tricky as I spent all of Saturday travelling to a meeting, having the meeting and then coming back. If you're on Twitter I suggest you follow me there and then you'll know exactly when posts go up on the blog. Or indeed sign up to the RSS feed!